Automate and streamline the appointment scheduling process for 2-1-1 contact centers, VITA/AARP sites and others. 2-1-1 contact centers across the nation spend thousands of hours scheduling tax counseling and other appointments for low-income families. However, most have no automated scheduling and appointment systems — making scheduling a hassle, and opening the door to over-bookings, under-bookings and no-shows. RiverStar Appointment Scheduler completely streamlines and automates the scheduling process. Consolidate all appointment scheduling from one centralized location, serving hundreds of locations, e.g., tax centers. Eliminate over-bookings and double-bookings with a centralized scheduling calendar that’s always up-to-date. Deliver agent and mobile friendly self-service scripts and notifications in multiple languages. 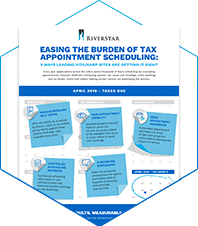 Learn how today’s successful VITA/AARP organizations are easing the burden of tax appointment scheduling. All scheduling information is kept in one central database, eliminating over-bookings or double-bookings. Administrators have full visibility into all scheduling information across all their associated sites. Agencies can update appointment/schedule availability daily so all schedules remain in sync. All scheduling criteria can be configured on a county-by-county basis with simple and complex screening requirements. Reduce no-shows with appointment reminders via email or SMS — in multiple languages. Reports can be sent daily to each location, e.g., tax agency for visibility into the day’s appointments. Download the RiverStar Appointment Scheduler Datasheet for A Full Features and Benefits Overview.